He runs an awesome blog and a couple of awesome resources pages which are worth your checking out. His title, “Ferrell Jenkins: Biblioblogger Extraordinaire” is a little much, but appreciated. Jim writes more than anyone I know. Reminds me of what some used to say about the late Dr. James D. Bales of Harding University: “He has written more than he has read.” Just joking. Thanks, Jim. Dr. West had the unfortunate experience recently of someone gaining access to his password and deleting his blog. I am glad he is back. He writes on a variety of subjects and I check his blog regularly. Agree or not, he will cause you to think. Check it here. I have had a link to Jim’s Biblical Studies Resources for a long time. Prof. Aren Maeir, director of the Tell es-Safi/Gath Archaeological Project, asked permission to post my 1969 photo of the tell which we posted here. I was honored to do so. He has given us some directional info that I overlooked. He says that it is “of the northeastern portion” of the tell. He comments on the changes that have taken place since 1969. Not only is the foto very nice, it is very interesting, since there are quite a few changes that can be seen on the tell since then. In particular, the intense 4X4 vehicle activity has taken a toll on the site, and a current view shows various parts that have been eroded away. Maeir’s post includes a recent photo showing the northeastern part of the tell from another angle. Take a look here. BOTH names that appear on the sherd (AWLT and WLT…) are etymologically very close to Goliath. All are quite similar to Indo-European, names such as Lydian Wylattes/Aylattes, which in the past have been etymologically compared to Goliath (way before this find). I can’t resist posting a tiny photo here. There is a wonderful high resolution photo of the shard online with other information. Read here. 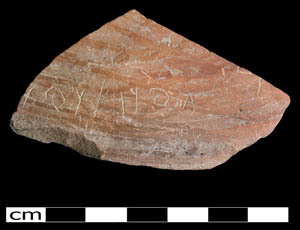 The excavation at Tell es-Safi/Gath this year will be July 6-August 1. Click here for some information about the dig if you have interest. This site, near the valley of Elah, provides a wonderful background for the conflict between the Philistines and the Israelites, between David and Goliath. Queen Mother Helena of Adiabene came to Jerusalem with her son, King Izates, as a convert to Judaish in A.D. 46. Adiabene was located in northern Mesopotamia east of the Tigris River. During the famine in Judea, mentioned in Acts 11:28-30, the queen sent to Egypt for grain and to Cyprus for dried figs (Josephus, Ant. 20.51). 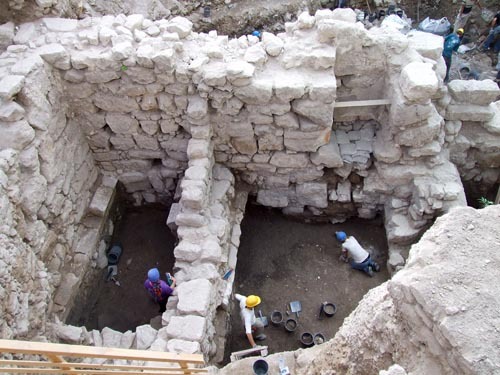 A recent excavation south of the Dung Gate, called the Givati garage area, has revealed a massive building which is being suggested as the palace of Queen Helena. So far there is no absolute proof that the Queen is to be identified with the structures, but it is a good suggestion. The reference in Josephus to the palace of the Queen in the lower city is helpful (Jewish Wars 6.355). In the excavations the Israel Antiquities Authority is carrying out with the Nature and Parks Authority and the Ir David Foundation, an impressive architectural complex is being uncovered that includes massive foundations; walls, some of which are preserved to a height in excess of five meters and built of stones that weigh hundreds of kilograms; halls that are preserved to a height of at least two stories; a basement level that was covered with vaults; remains of polychrome frescoes; water installations and ritual baths (miqve’ot). 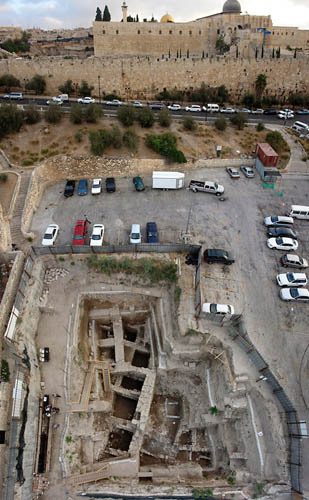 This photo shows the excavation at the bottom and the south wall of the old city of Jerusalem at the top. 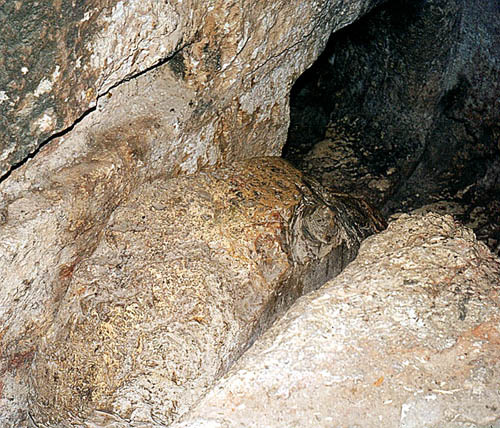 The City of David is directly to the right of the excavation. The photo below shows details of one portion of the excavation. The excavation turned up stone vessels, pottery, and coins belonging to the end of the Herodian Temple [Israelis call this the Second Temple] period. This means prior to A.D. 70 when the Romans destroyed the temple. 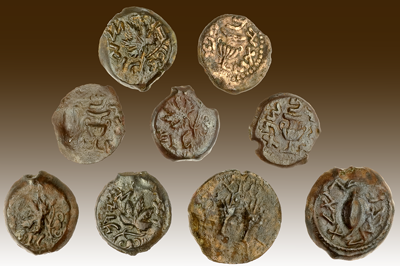 These coins bear images of, among other things, a vine leaf, a chalice, and an amphora with handles. A large burial complex was dug north of the city for the burial of the Queen and her family. This is the tomb referred to in modern times as the Tomb of the Kings. It is a good place to see a rolling stone and a tomb hewn from solid rock. The property is under French control and the last three or more times I have been there it has been closed, and I was unable to rouse anyone by ringing the bell.